At the Digital Workshop offices, we all have to wear many hats to get done what we need to do each day. As any small-business owner will probably tell you, that’s the norm until you grow to where you can afford to build a bigger staff. Personally, I rely on lists and Google calendars to help me remember what I’m supposed to be doing for various projects, to meet deadlines and to stay on top of my various business roles. I’ve always been a paper and whiteboard list guy, so much so that almost an entire wall of my office is currently filled with whiteboards. However, as with many digital trends, the days of my giant whiteboard to-do lists may be going away soon. Through a Meetup group of the Northern Colorado Internet Professionals, or NCIP, led by Ron Zadinski of CodeGeek.net, I was introduced to a new online bulletin board tool called Trello. Trello is a free tool that replaces the need for any paper or whiteboard to-do lists, and it adds modern features that any small-business owner will love. For starters, it allows you to create endless to-do lists on digital bulletin boards. The boards are easy to manage as Trello allows you to invite other co-workers or collaborators to help update the board information. All updates can be done in real time, so if you were looking at the board and adding new tasks at the same time as someone else, you would be able to watch them type as they go. With a board for each project, my projects are better organized and managed with the people involved. In addition, there are categories for each to-do on the boards. For example, there are sub-lists for “upcoming,” “doing” and “done” tasks. With a simple drag-and-drop interface, I can move a task from one sub-list to the next and stay on top of the progress, and also alert anyone else assigned to the task at the same time. Other useful features include color coding, task assignments, linking to existing Google calendars and many more. If you need to export the information or print it out, you have some easy options to handle those scenarios. A good real-world example of Trello in action would be how we’ve used it for our new marketing plan at the workshop. One of my co-workers and I have been devising new marketing strategies for months and are now putting them into action. 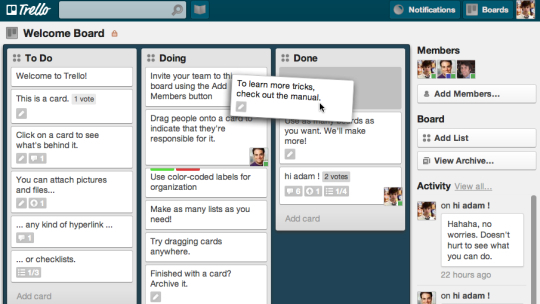 We first moved the action plan to a Trello board and started assigning tasks to one another. As I update a task or have something related to share about any other, I can easily drop in a comment. At the end of the day, Trello prepares a summarized email of the day’s events and sends it to anyone who may be affected by my updates on the board. With new online tools like this being introduced to me all the time, we may very soon be at a completely paperless office. And I’m going to be OK with that.